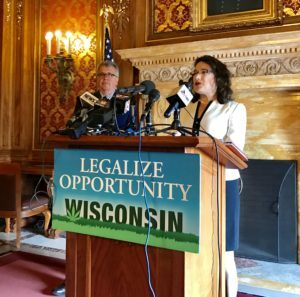 As more states begin to look at legalizing marijuana as a way to generate new revenue, a Democratic state lawmaker once again wants to add Wisconsin to the list of those considering the move. Sargent’s previous bills to legalize pot have failed to get any Republican support, and the current attempt is likely to face a similar fate. “I’m hopeful that this year will finally be the year that my colleague’s get past that pesky ‘D’ at the backside of my name,” she said. Assembly Speaker Robin Vos’ office said he does not support the bill. The more than 100 page bill from Sargent and Representative Todd Ohnstad (D-Kenosha) would legalize marijuana for recreational and medicinal uses. A Marquette Law School poll from July of last year showed nearly 60 percent of those surveyed said marijuana should be legalized like alcohol.